Testicle pain relief is technically not "joint pain relief"……but I've had way too many male clients who've suffered unnecessarily from this condition, so I've decided to include it on this website. It's usually a pretty simple fix. There is a separate Scrotum Pain Relief page if you can tell the pain is in your scrotum and not your testicle. If you're unsure, doing both pages can only help. Introduction Video, Testicle Pain Relief Video. What you're experiencing is actually a very common symptom among men. It is usually caused by tight muscles in your hips pulling on the nerves that go from your tailbone to your scrotum. This is similar to the way sciatica pain is felt down the back of the leg from the sciatic nerve in your hip being pulled on by your hip muscles. This is the most common cause of scrotum pain. There are other causes as well, such as kidney stones, etc. so if the techniques I share below give you no relief, you may want to consult your doctor. Even in the rare cases of testicle cancer only 1 in 10 of those who actually have cancer report pain as a symptom. BUT, But, but…… it is also important to rule it out with a quick testicle cancer self-exam (click here) that anyone can easily do themselves. Detecting a lump on your testicle can literally save your life, so it's worth the sixty seconds of your time to perform the test. Especially if you are between the ages of 15 and 35 when most cases…..though rare……of testicular cancer do occur. Now that we're clear, let's get rid of that pain, so you can get on with your life. On the homepage I describe…in detail…the 3 Simple Steps and the 4 Basic Facts about your body that make it possible for you to provide your own pain relief. It's good to know why what you're about to do actually works, but it's not required, so I'll leave that decision to you. There's a 95% chance that you......like thousands upon thousands of others.....can fix yourself, all by yourself, so let's get to it. Also, in the future you may only need to do one or two techniques to get instant testicle pain relief, but you've got to go through the whole sequence to find your individual pain treatment. Pay attention to which of these specific techniques works best for your body. 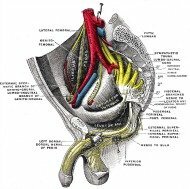 The nerves that end up at your testicle originate from the lower portion of your tailbone (sacrum). This muscle tissue around the lower portion of your tailbone needs to be freed on both sides in order to obtain the pain relief in your testicle you are seeking. The tennis-ball-press technique is a great way to free up any short tight tissue that is stuck on your sacrum. It's pretty simple too! Just lay down and put a tennis ball under your sacrum. Then investigate around a bit to find a tight/painful area, which means the tissue is tight. Then do a press-hold-move-technique by putting your bodyweight into the tight tissue via the tennis ball and then raising your bent leg as far up and down as you can to make the tissue that is being pressed on move just a bit from your movement. When dealing with the hips, you always want to doboth sides. Usually, tension on one side is compensated for by tension on the other side as well. While sitting or reclining on a chair, mat, or the floor, we'll start with the tennis-ball-press technique. Since we've already released any tight tissue on your sacrum, now we want to release any tight tissue along the edge of your sacrum, and any tight tissue in your hips. You'll want to really make sure any tissue in the lower half of your buttocks is free, especially down near the bottom of your buttocks. That said, don't forget the top half as well, since that's important too. Just use your bodyweight to apply pressure to any tight spots and a then move your leg or legs in way that makes that tight tissue move. And don't forget to repeat the process on the other side of your buttocks as well. It's important! You really will want to watch the video for this stretch, since a lot for you to decipher from a written description. First, by doing the stretch the way I show you with one arm over your shin and the other gripping that arm through the space in your legs, gives you much, much, much, more leverage than the way most people traditionally do this stretch. Most folks do this stretch by pulling back on the opposite leg and it just doesn't give you much torque to get at those big gluts and other hip rotators. Second, if you flex the hip that is being stretch and then release it multiple times during the stretch you'll often get more done than by just remaining static. And third, switching back and forth from side to side after each repetition can often achieve more rapid results than only doing one side for multiple reps. But experiment with both ways to see what works for you. Now go for it, and get those hips released. If I could only do one stretch for testicle pain relief it would be this one. Between sitting on the tennis ball and this stretch you should be able to get a lot of tissue release that is causing your problem. The video shows the stretch better than I can describe it, so let me just say that ideally you will feel this stretch deep in your lower buttocks. And the nice thing about the stretch is you can do it for a while without much stress on your body, so play around with what angles work best for you to lean over your shin and ankle. Feeling this stretch in your inner groin is fine too. If that's where the tension is, then releasing it will only help. Do both sides of the body. How much did this stretch reduce your testicle pain? Note: Feel free to do these stretches as often as you desire. They could be your secret treatment if the pain in your testicle ever returns. If you did these every day, especially if you sit at a desk all day, it would be wonderful for avoiding future knee joint pain, lower back pain, calf pain, ankle joint pain and achilles pain. These are great stretches for many of your body's aches and pains. Feel free to make a habit of doing them. Is your testicle pain completely gone? Partially gone? Which techniques gave you the most testicle pain relief? Was there one specific testicle pain treatment that instantly relieved your pain? Are you still experiencing some testicle pain? Investigate a bit and you'll eventually find which techniques work best for you to provide the best testicle pain relief. Then you'll be able to fix yourself whenever you desire because you'll have your own personalized testicle pain relief treatment……literally at your fingertips!